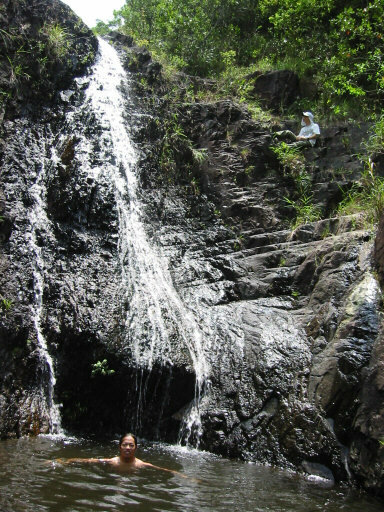 Sai Keng Stream originates from the eastern face of Ma On Shan. Its water passes through the Sai Keng Village to the Kei Ling Ha Hoi (Three Fathoms Cove). 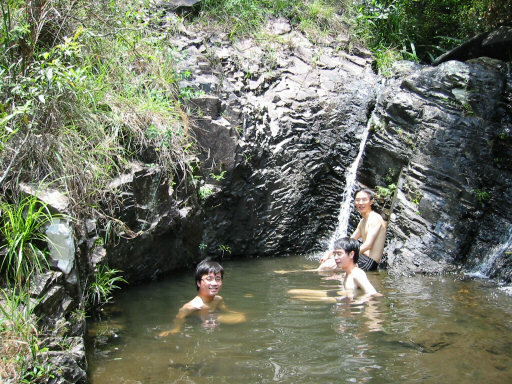 You can arrive at the entry point of this stream trip by taking a bus or a taxi which runs along the Sai Sha Road. The stream is not very long. It has some nice pools, good enough for a bath in the hot weather. After reaching the top of the fall, look backward. You can appreciate the beauty of Kei Ling Ha Hoi (Three Fathoms Cove). A tiny pool is waiting for you. Soaking in it refreshes oneself. If you look carefully, you can find tiny fish, shrimps, tiny crabs and frogs in this wonderful pool. Keep going. 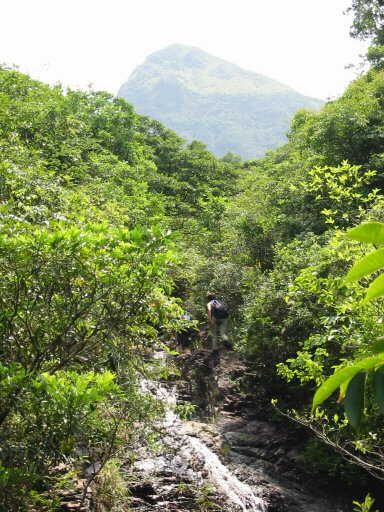 At around altitude 105m, you will move into a scrub region at the right hand side of the stream. Listen and look carefully. Don't miss a waterfall with a bigger pool. FInd your way to get into the stream (in front of the pool). The depth of this pool is about 5 feet. You may want to take a swim or a water bath here. 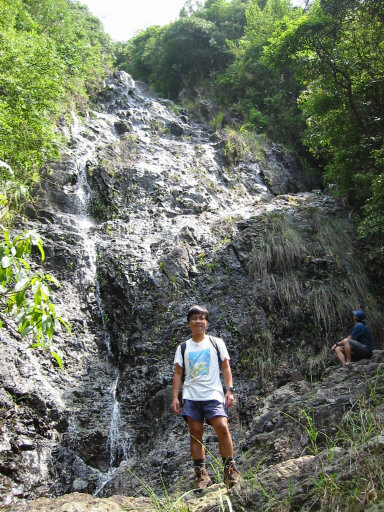 After enjoying yourself, continue your stream trek at the right hand side to get to the top of the fall. 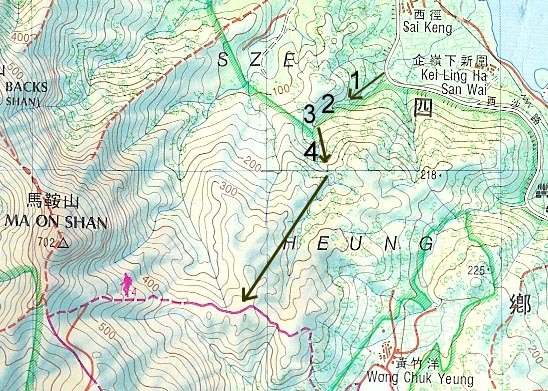 You can see the top of Ma On Shan from a special angle while doing this stream trek. At around altitude 160m, you will encounter a big-faced cliff. It is about one hundred feet high, with a narrow top and a wide base (look like a triangle). It is impossible to climb on this cliff with bare hands and feet. You should take a route on the right hand side again. It will bring you to the top of the cliff and back into the stream. After that, there is no more big waterfall or pool. Follow the stream, which will get narrower. Pay attention to ribbon hanged on the trees/wood, which will guide you to leave the stream. 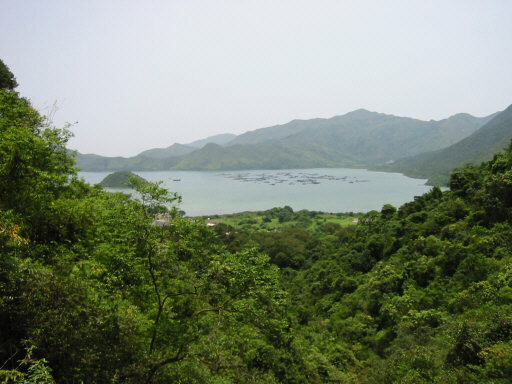 Follow the ribbon, you will find the hidden path which leads you up to the Maclehose Trail. It's better to wear long trousers while walking along this path.